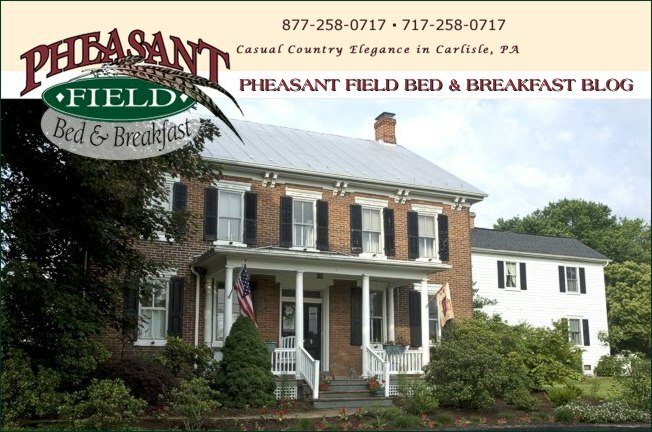 The weather is perfect this weekend for your fun fall getaway to Pheasant Field Bed & Breakfast. We had a cacellation for Saturday & Sunday nights - so if you are waiting for the last minute to decide about your Columbus Day weekend travels, this IS the last minute! What's happening in the area this weekend? I'm glad you asked! - Looking for fall fun? Found it with information from our local visitors' bureau! You will find bird watching, a pumpkin festival, corn maze, and a fall foliage driving tour. - How about a concert? Or two? The Three Phantoms will entertain you at the Hershey Theatre or you can enjoy live music with your dinner at The Green Room where The DeAngelo Trio will be perfroming. - Want to create your own Jack-O-Lantern? Meadowbrooke Gourds will provide the creative fun for you (or you can just buy one from their artists!). - Speaking of Artists, it's American Craft Week and the Village Artisans are celebrating! Biking, hiking, kayaking are other great ways to spend your fall getaway weekend in Carlisle PA! Call us for that last room that's still open for Saturday and Sunday - 717-258-0717!